in Oxford. Let me explain why the plan was made and then I will comment on what it tells us. The early inhabitants of Wolverton, having no back gardens, were given allotments. In the 1840s this was about the only way of organising your own vegetable supply, there being no greengrocers in Wolverton. The first allotments were laid out in the eastern field by the canal at some distance from the houses. However some of the Bury street residents, quickly realising that their back yards opened directly onto a field decided to help themselves. This is the field coloured in red on the plan. Some even kept pigs. The farmer complained to his landlord, the Radcliffe Trust and the Trustees called in Mr John Driver to investigate and make a report, which he did on April 14th 1847. He did recommend selling more land to the LNWR for allotments, but his more sensational recommendation was to build a six foot hush brick wall around the railway property. 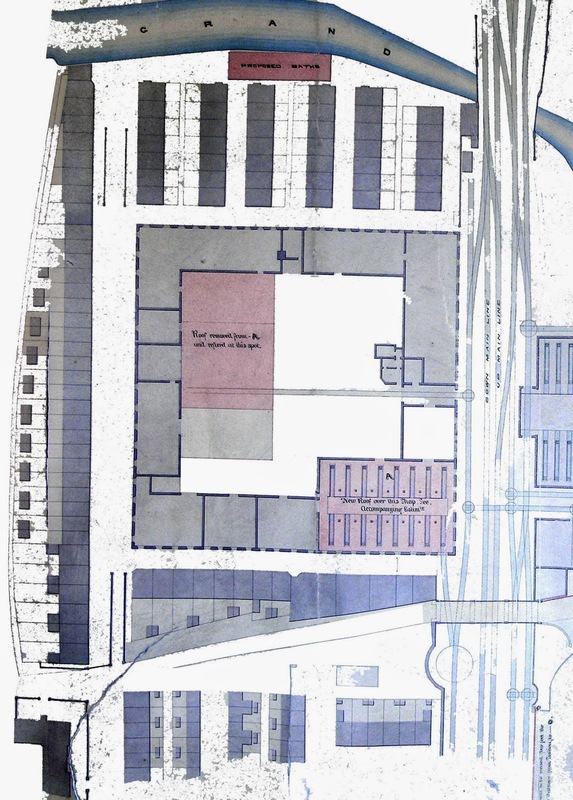 This was to be built at the railway company’s expense and I suspect that it was never built. What Mr Driver did leave behind is this interesting plan of Wolverton in 1847. 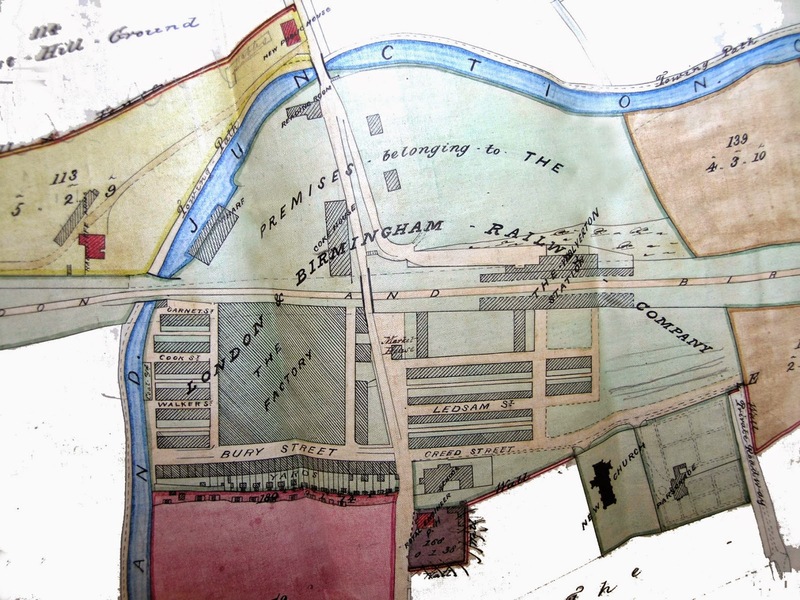 The green coloured area was the extent of railway Wolverton at the time, although it may not be entirely up-to-date as the second Engine Shed, on the east side of the line was certainly started in 1845, and the Gas Works had also moved by this time. So there are some curious anomalies here. The Royal Engineer, for example, is outside Wolverton on Radcliffe Trust land. This is because it was a condition of sale to the railway company that no licences premises would be permitted on railway property. This also explains the location of the Radcliffe Arms in that field which later became Wolverton Park. I have told the tale of the Radcliffe Arms before, where two enterprising Stony Stratford businessmen took out a long lease on these four acres and rushed to complete their new hotel by 1839, next to the first railway station, only to learn the following year that the railway company had moved the station to a new location. The Radcliffe Arms was thus isolated from the town, and indeed travellers, but what this plan shows is that they finally had decided to build a new Radcliffe Arms beside the road. This is pretty much the spot where the third station was built n 1881. We can also note from this map that the extension of Creed, Ledsam and Young Streets is about to start. Some rough pencil lines indicate the proposed terraces. The new road to Stratford had been cut through in 1844 but the approach road to the station still comes from the west, as if carriages would come from the Od Wolverton Road. It seems that this was certainly the case when Queen Victoria arrived here to spend the Christmas of 1844 at Stowe. Instead of taking the new direct road she processed down to the old road and thence to Stony Stratford. I suppose the hairpin bend shown on this map caused some royal nervousness!